Hollywood is upset about the NSA spying scandal first exposed by Edward Snowden. It’s livid. In fact, it is so angry that it thinks Richard Nixon is still the president. Maggie Gyllenhall, Oliver Stone, John Cusack and Will Wheaton all lend a hand to ‘Stop Watching Us’, which is hilariously edited together without a single photo of President Obama making the cut. Someone should tell “Wesley Crusher” that it’s hard to take his group’s concern over NSA surveillance seriously when President Obama (the guy who has a “Terror Tuesday” kill list) is missing in action. 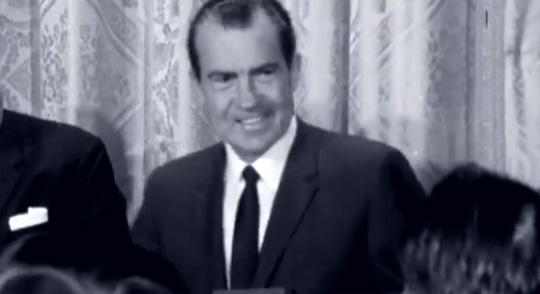 Instead of including a shot of Diane Feinstein, the woman who defended NSA spying revelations on the grounds that innocent Americans might become terrorists “in the future,” we get Richard Nixon. Instead of seeing an image of President Obama — the guy who came up with the amazingly Orwellian-sounding ‘Disposition Matrix’ — we get Richard Nixon. 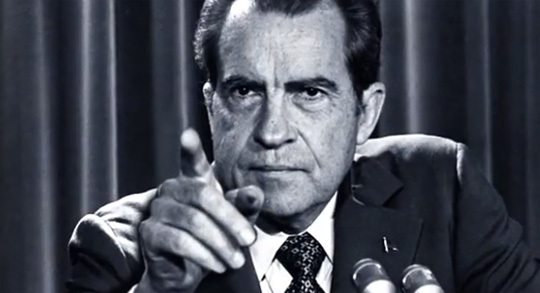 Instead of getting pictures of White House Press Secretary Jay Carney, whose job is to spin, spin, spin NSA scandals away on a daily basis … we get Richard Nixon. Watch the video and have a good laugh. The only other option would be to cry. 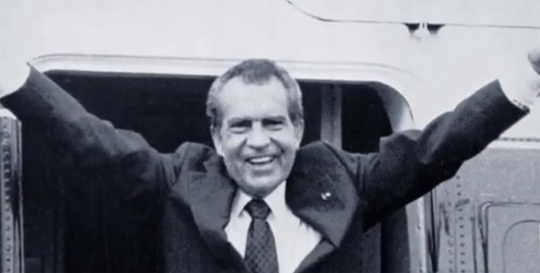 Oh hey, there’s Nixon again. And there he is again. Weird. It’s almost like it’s 1970 instead of 2013. Apparently, John Cusack hasn’t been reading his New York Times, or he’d know that Richard Nixon isn’t the president and hasn’t been for a long time. Poor John. He wants so terribly to be taken seriously, but his ideological world view is so sacrosanct that he can’t bring himself to take part in a project that brings President Obama to task in any meaningful way. Maybe a few more years of scandals will bring him around. Indeed, it gave me a good chuckle as well. Somehow, even though he’s been dead since 1994 and hasn’t been President since 1974, Nixon is somehow to blame for the NSA scandal? I’m surprised they didn’t try to tie in George W. Bush and the Koch Brothers if they were going to stretch reality that far. Earth to Hollywood: Barack Obama is President, has increased the scope of the NSA’s programs and Diane Feinstein is a big booster of the NSA’s spying programs. More signs Tinseltown is disconnected from reality. They almost had to leave Obama out, because I’m sure there is still a digital trail for some of the people in the video. Once upon a time they were singing President Obama’s praises… It would have been fun to juxtapose some older Cusack quotes with his sudden concern over the NSA spy program. I’m British and have to be honest if I was American I would be a Republican. All the democrats and Liberals seem to be buck-shifting morons who have closed minds to anyone’s opinions other than what they are told to think. Pretty much every liberal/Democrat I’ve met in my life has been close-minded and unwilling to accept views other than their own. I have one liberal friend who is a true liberal in the sense that he is open to alternate viewpoints and that even though I often disagree with him, I still respect his opinions and vice versa. That is the way it should be, but my friend is the exception to that rule. Iv heard that the Xbox One only exist as an NSA spying device. I don’t know if that’s true but it does make a lot of sense since Microsoft has lost billions on Xbox, the general crappiness of the one, the manner it transmits information and the “improved” Kinect. Yet another reason I don’t really play games anymore or have an interest in video-games. is anyone here concerned about their privacy? In an era where we all use email, text messaging and social networks on a daily basis do any of us have any real privacy left? My answer is therefore no, I’m not concerned. I’m not worth spying on. My life is generally quite dull but if some NSA hacker gets some thrills by the occasional dirty text then by all means let them carry on. The real concern is that Obama is either authorising the NSA to spy on people worldwide which is a flagrant misuse of his powers, or he is just completely unaware of it. In fact he seems to be unaware of quite a lot. Maybe your next president will make it his job to know what’s happening rather than push through nonsensical policies which harm middle America. In summary: AJ’s concerns over the implications of NSA spying only extend as far as AJ’s life. Simply put Doug, that’s correct. Although do I agree with the NSA spying on world leaders who are allies? No. Do you really think the intelligence agencies of our allies aren’t spying (or trying to spy) on American officials? This isn’t a new phenomenon. Widespread electronic spying that ignited a political firestorm in France and Spain recently was carried out by their own intelligence services and not by the National Security Agency, U.S. officials say. The phone records collected by the Europeans — in war zones and other areas outside their borders—then were shared with the NSA, U.S. officials said, as part of efforts to help protect American and allied troops and civilians. The new disclosure upends the version of events as reported in Europe in recent days, and puts a spotlight on the role of European intelligence services that work closely with the NSA, suggesting a greater level of European involvement in global surveillance. Of course they are. The NSA’s problem is that they have been grassed up. But its OK folks, Obama didn’t know anything about it! Yeah right. You can’t say anything bad about the current president if you want to act again. 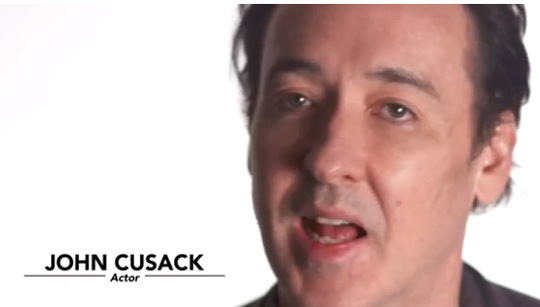 Cusack’s a mediocre actor at best. He’s had to kiss liberal tush to keep on the casting list. When you look up the word ‘smarmy’ in the dictionary, Cusack’s picture appears. I have a gut check reaction to the guy on general principles based on his appearance and when you delve into his politics, the gut churning is justified. Rotten Tomatoes gave 2012 a 39 percent rating, and Raven got a 29 percent. Suffice it to say I’ll never spend a red cent basking in the reflected glow of Cusack’s personae on the Silver Screen. You’re right about John. He’s a guy who has referred to himself as an “apocalyptic s**t disturber and elephant trainer.” Telling. And then of course you have his affinity for Alan Grayson. When Grayson isn’t likening political rivals to the Taliban, he goes for the KKK comparison.